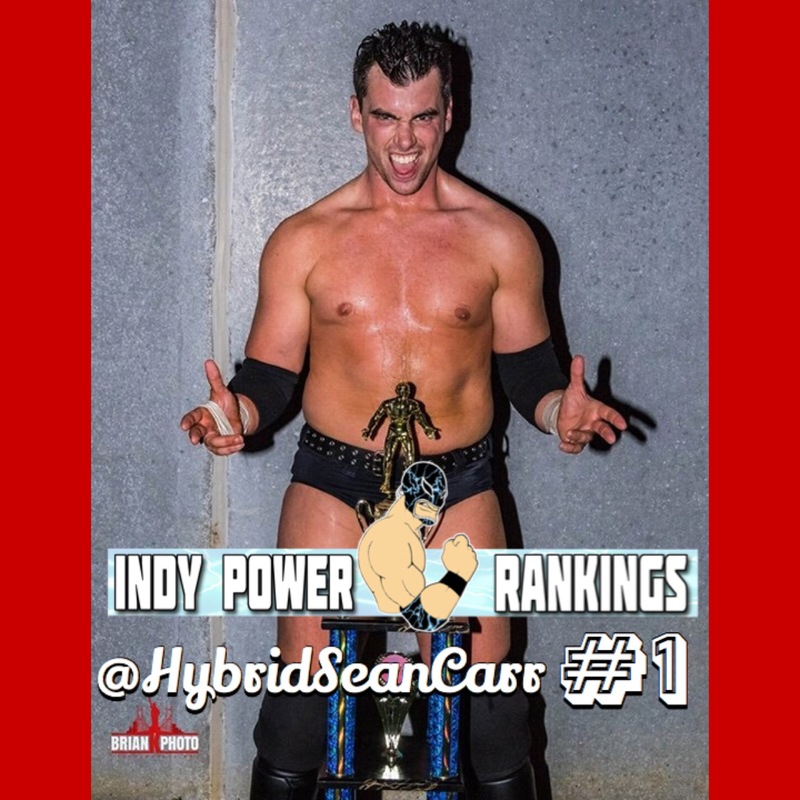 #1 Sean Carr (@HybridSeanCarr)-Since 2013, the ECWA Super 8 Tournament has played a major role in the Indy Power Rankings, but through various circumstances it had never led to an official #1 ranking for its winner…until this year. Sean Carr stepped in for Joey Janela as he defeated Brandon Scott on 4/29 in the First Round, then beat Joe Gacy in the next round, and then beat Lio Rush in the Finals to win the tournament to go 3-0 for the week. Carr benefited by being the alternate who was substituted in as he defeated some big names to get his first #1 ranking after winning one of the tournaments with the richest history on the indies. He was also #2 in the online voting competition with 38 votes. 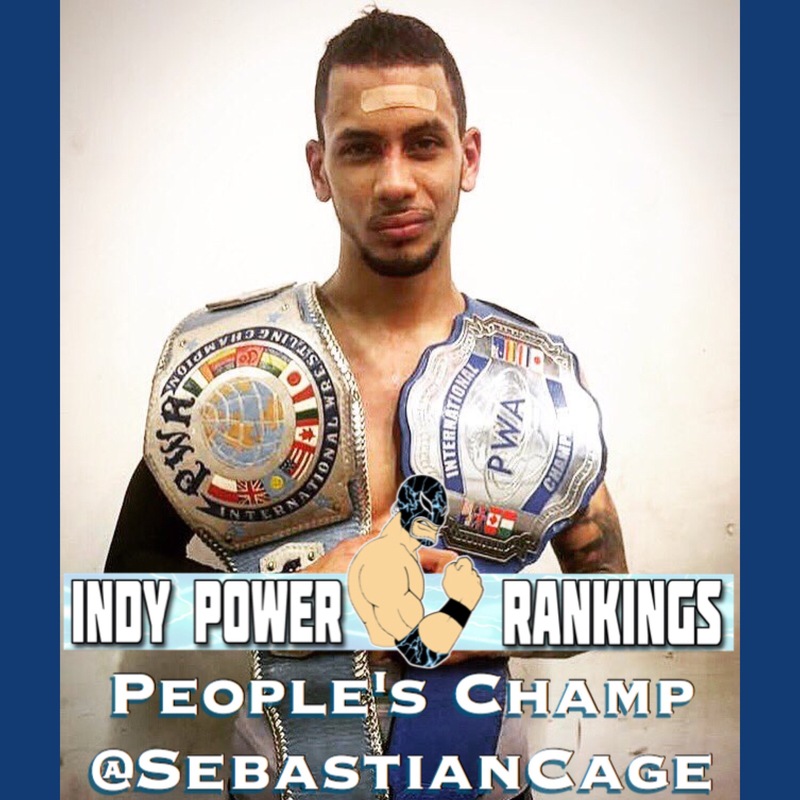 #2 Josh Crane-Once again this year, the IWA Deep-South Carnage Cup plays a part in the Indy Power Rankings as its winner pulls off a #2 ranking after winning the gory tournament. He defeated Matt Tremont on 4/29 in the first round, then defeated Adam Bueller, Jeff Cannonball and Shlak in a four-way in the semis, and then defeated Dale Patricks in the final to win the 2017 Carnage Cup. He battled through blood loss, barbed wire, and God knows what else to get his first ranking in quite some time. In doing so, he beat some of the best Death Match talents (and talents, in general) in the game today. If Crane can continue this momentum, perhaps we’ll be seeing him in the rankings again this year. #3 Joey Janela (@JANELABABY)-“The Bad Boy” went 4-0 for the week and we can only imagine what he would have done had been able to participate in the ECWA Super 8 Tournament as he was originally scheduled to do. Wrestling politics aside, Janela made the most of his bookings as he defeated Mr Grimm at Limitless Wrestling on 4/28, then defeated Maxwell Jacob Feinstein at Blitzkrieg Pro on 4/29, then defeated Donovan Dijak the same day at Beyond Wrestling, and then teamed with Penelope Ford at Beyond on 4/30 to defeat Brian Milonas and Ace Romero. Joey came away with support at #1, but it was kind of a week of what could have been if he could have somehow ended up at 7-0 for the week. “The Bad Boy” continues to stay relevant as he just keeps finding new ways to promote his brand. 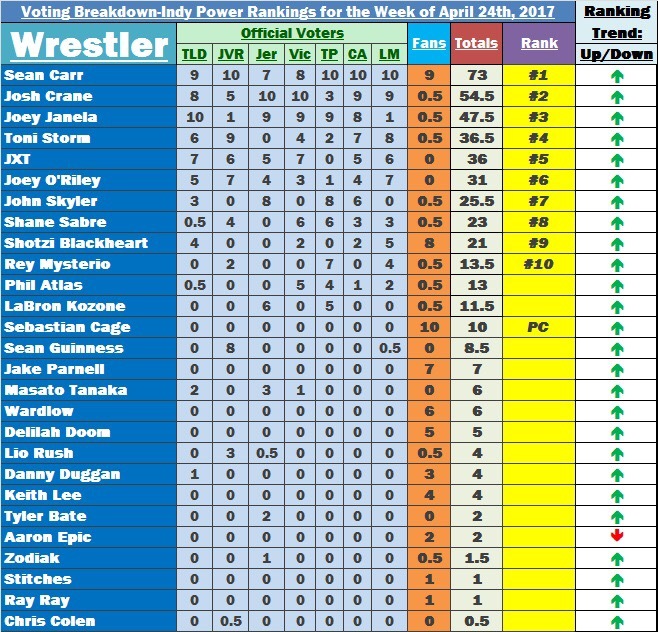 #4 Toni Storm (@tonistorm_)-The SWA Undisputed World Women’s Champion has been hovering around the Top 10 all year long and now she breaks through with an awesome performance over the weekend. She won the 2017 Cinderella Tournament as she defeated Rebel at Stardom on 4/30 in the first round, then defeated Tessa Blanchard in the second round, and then defeated Mayu Iwatani in the final to go 3-0 for the week. Toni Storm continues to build on a fantastic 2017 as it appears this is just the tip of the iceberg of what we can expect from her this year. #5 JXT (@OfficialJXT)- This Australian talent gets a GREAT ranking after a HUGE week. The Melbourne City Wrestling Intercommonwealth Champion defeated Alex Kingston on 4/28 at MCW in Australia to retain the title, then defeated Shane Saw at Australasian Wrestling Federation on 4/29, then defeated Josh Shooter the same day, then teamed with TNT to defeat VIP (Jarrod Idol & Jax Jordan) then teamed with Joel Bateman & Shane Saw on 4/30 to defeat Josh Shooter & VIP, and then teamed with Shane Saw the same day to defeat VIP (Jarrod Idol & Jax Jordan) to go 6-0 for the week.